Since the last time I posted, I got a new job, quit my old job, flew to Minneapolis, crashed at my brother's house for three week, flew back to Portland, drove to Minneapolis with Laurel and the cats, camped in our new house until our things arrived, unpacked our things when they arrived, and finally set up my new kitchen. Needless to say, I fell off the wagon a little. The GAPS wagon that is. When we got the news that I got the job in Minneapolis and that we would be moving across the country shortly- I held out, thinking that if I just prepared and froze enough almond flour muffins to get us by until I could cook again in our new kitchen, then we would be able to stay true to our GAPS doctrine. I prepared the best I could, however due to my kitchen implements slowly disappearing to moving boxes and one incredibly disruptive construction project, I had to let go. At my brother's house for three weeks I tried to enjoy my unplanned dietary freedom-- I drank beer and ate ice cream, feeling guilty but knowing I would soon be back on track. On the road from Portland to Minneapolis, we ate cheese, fruit, salami, and kombucha. Once in our new house, it took some time to get the kitchen set up, stock our fridge and pantry, and prepare the foods we would need to sustain us on GAPS, so we gave ourselves another break-- we would do the best we could through the move and the month of October, and in November we would start fresh. We would start with the GAPS introductory diet. Full of bone broths and boiled meat, the intro diet now looms ahead of us. We tell ourselves that since we are both feeling pretty well, we should get through it quickly, maybe only a couple of weeks. Time will tell. For now, I am contently preparing a multitude of full GAPS foods and ferments to sustain us on our journey. The squash chips were inspired by my mother! 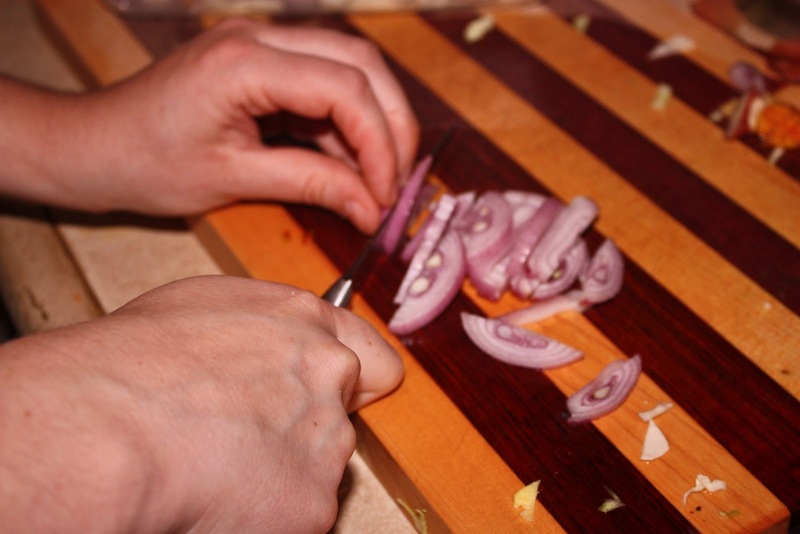 Slice delicata squash thinly and lay on a baking sheet lined with parchment paper. Brush with melted coconut oil and sprinkle on celtic sea salt and crushed pepper. Bake at 375 until crispy and a little caramelized. 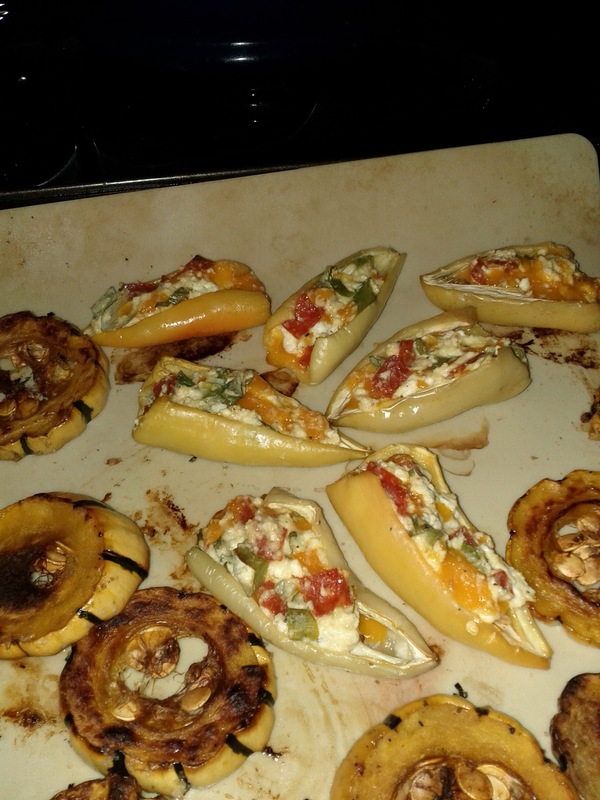 The Stuffed peppers were inspired by the stuffed jalepenos in Natasha Campbell McBride's cookbook, "Internal Bliss." I had a bunch of small banana peppers from the farmer's market so I used those instead of jalapenos For the filling I mixed up some dry curd cottage cheese, a little grated cheddar, some chopped scallions, a couple pieces of natural pepperoni chopped up, an egg yolk, and some salt, pepper, and garlic powder. Bake at 350 or so until slightly brown and cheese is melted. 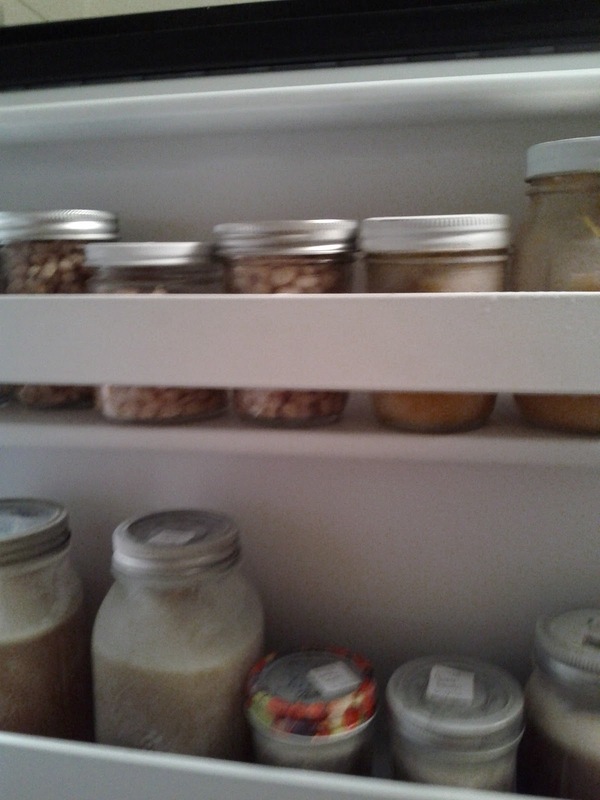 Below: Sprouted and slow cooked navy beans, now in the freezer for future quick use, roasted and pureed winter squash, slow cooker mixed bone broth (buffalo, pork, and beef bones from my beloved seward coop), and good ole chicken stock. 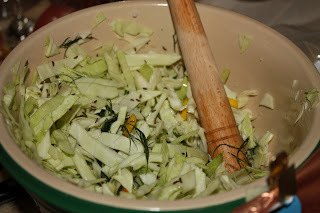 New batch of sauerkraut fermenting in the covered crock with farmer's market veggies: green cabbage, yellow beets, fennel, carrot, fresh ginger, celery seeds, caraway seeds, black pepper, celtic sea salt, and love. The red jar next to it is Beet kvass: red and chiogga beets, apple cores, ginger, whole cloves, zest and juice of half a lime, whey, celtic sea salt, and filtered water. 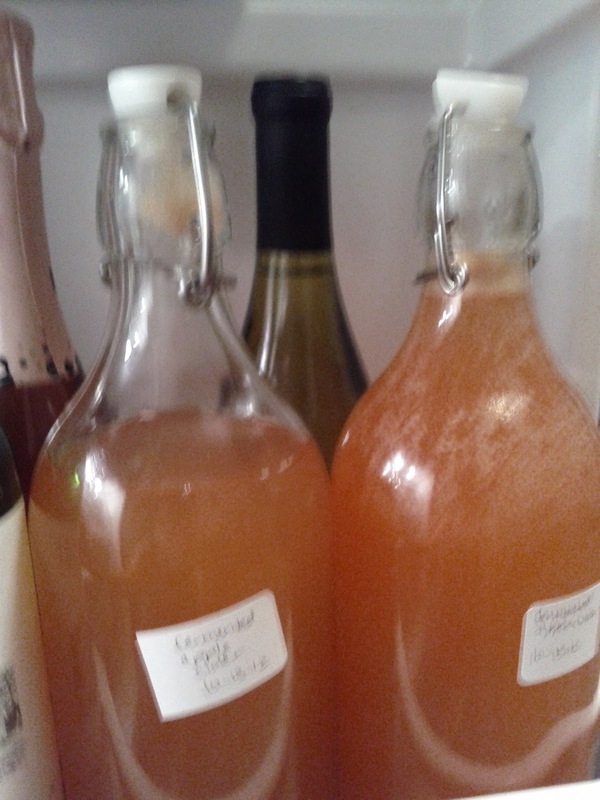 Nourishing Traditions fermented apple cider! I bought 4 dozen apples at the farmers market, juiced and strained them, then mixed the juice with a little salt and whey and let it sit in a big bowl on the counter for 3 days. Today I strained it again and poured into bottles in the fridge. Tastes a little reminiscent of kombucha but not so vinegary. I am excited to see how the flavors develop over the coming weeks. Bonus: I made apple fruit leathers with all the pulp leftover from juicing. I mixed in a little honey, all the foam I skimmed off the top of the juice, and some chopped dates. Then I blended it up and smoothed onto parchment paper and popped them in the dehydrator for 14 hours. Homemade yogurt and creme fraiche! I have not been able to find raw milk yet in Minneapolis, so I settled for some nice glass jars of pasteurized milk and cream from a local dairy. The creme fraiche is rich and buttery and the yogurt is thick, and even thicker after dripping the whey out. 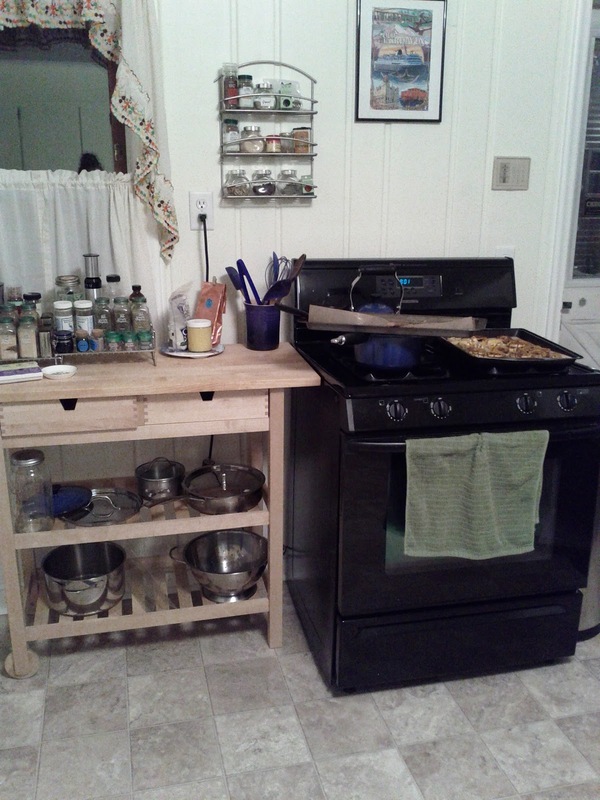 So nice to have a kitchen again! Today is our second day on the full GAPS diet. 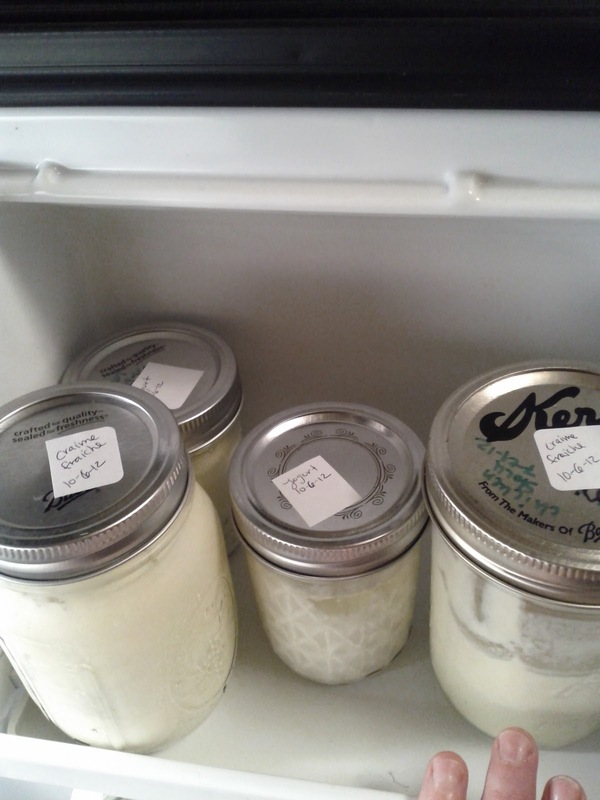 So far we have been feasting on homemade yogurt (turned out great), a batch of cream cheese (made by dripping some of the yogurt), my first sauerkraut, and pickles (second batch turned out great!). Last night I decided to give Laurel a break from meat eating and made some lentil soup (with homemade chicken stock of course). We had the soup and a salad with fresh grated chiggoa beets and toasted pumpkin seeds and a slice of SCD bread. Tonight I made turkey liver pate on homemade crackers which we both ate as fast as we could to get it over with sooner, Laurel with her nose plugged. 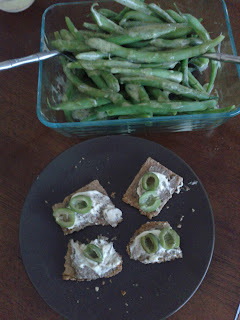 On the side we had fresh steamed green beans from our farm share (picked today!) with a mustard dill dressing. At some point I am going to have to figure out a way not to cook every night, and to be able to eat leftovers for more than just lunch the next day, because the dishes situation has been out of control with me making everything from scratch. With two bandaged fingers (one from a kitchen knife incident and one from an evil thorned weed in our garden) Laurel stepped in and did all the kitchen clean up for the last two nights. But I know this is too good to last. At a Board of Directors meeting today, I found myself in an uncomfortable position of having to bring the lunch and not being able to eat any of it. Grab a sandwich, one of the board members said as I passed them out and described their contents. "Oh, I'll eat after the meeting," I said, hating to sound like one of those women, but not wanting to go into the whole story of my weird diet. Not really the right crowd. After the meeting, I scarfed down a homemade sandwich I had brought from home-- leftover sliced turkey breast with lettuce, mustard, cheese, and sauerkraut on my homemade bread. Besides the bread tasting like cooked eggs (all SCD baked goods do!) and falling apart, it was pretty good. Obviously two days in is too quick to tell any substantial changes, but I have been closely monitoring my symptoms (low energy, stuffed up nose, itchy skin) for signs of improvement. I have been a little more congested than usual lately, which I have been telling myself all sorts of stories about what it could be from because it is definitely not due to my increased dairy consumption.... (I just got dairy back after all these years, and don't want to give it up!) I have also been pretty tired, conking out by 10 pm the last two nights. But my belly has felt great-- no bloating or feelings of being stuffed or uncomfortable. Laurel has also experienced some of her usual symptoms. Yesterday after eating an egg, an apple, and almond butter she felt nauseous. Since none of those foods are generally triggers, one guess is that the combination of fruit and protein at the same time was bad, or maybe it was some kind of detox reaction. I am so sold on the GAPS philosophy that I am unable to think of "if" GAPS will work for us, instead wondering "when." On to day three, and almost the weekend. Tomorrow we drink single malt scotch while watching a friend play at the Alberta St. Pub! So maybe starting a jar of pickles in 70-80 degree weather and then leaving town for a week was not the best way to try my hand at making sour cucumbers. Needless to say, my first attempt was mushy and unappetizing. The sauerkraut on the other hand turned out great! It was yellow from the beets and pungent from the ginger and garlic. Laurel and I both had some for lunch! 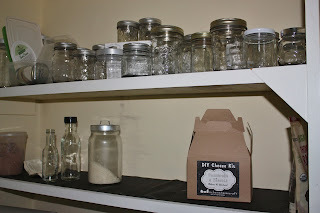 After a trip to the farmers market to stock up for the week, I decided that today was the day to do the final purging of our cabinets and fridge as we were planning to launch into the full GAPS diet on August 1st. Before putting my beautiful produce and eggs away, I did a thorough cleaning of the fridge drawers and shelves and pulled out everything processed and otherwise GAPS illegal: ketchup, mayo, fish sauce (made with sugar), jam, tofutti sour cream (sorry, Laurel! ), maple syrup, and hot sauce! 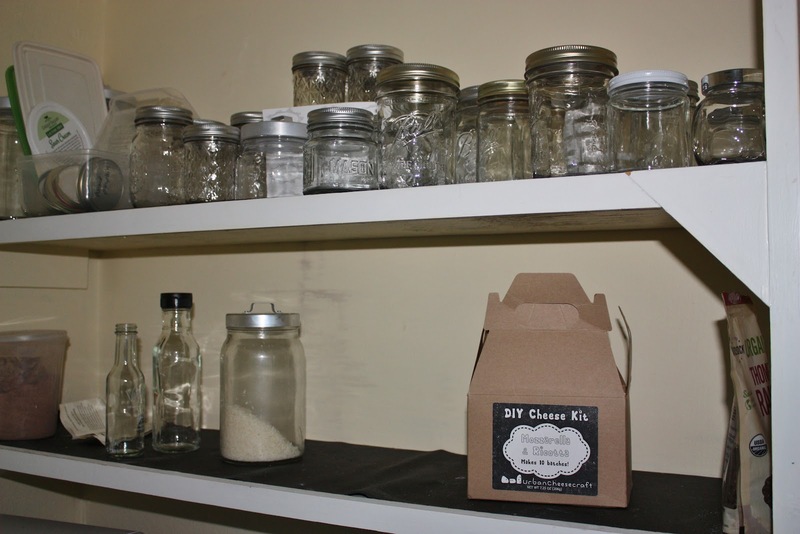 I then turned to the pantry, pulling out jars of dry garbanzos, cans of pinto beans, agave syrup, quinoa, coffee, and more. It was sad to say goodbye to so many tasty (and expensive!) products, but I knew of a good home for them. Laden with two grocery bags and one cardboard box full of the exiled items I headed over to a house where some friends were having a garage sale. They were thrilled to receive the bounty and we ended up talking about the diet (i.e. 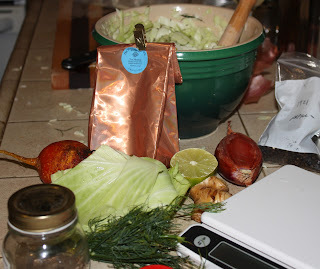 why we were getting rid of all this stuff) and fermentation. I told them about my pickles that had gone ary and my kraut that was fabulous. 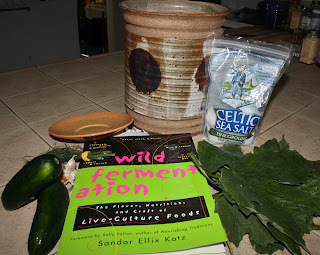 One of them, a seasoned fermentor, offered me a beautiful ceramic crock from their own kitchen plus fresh grape leaves to help maintain the crispness of the cukes. 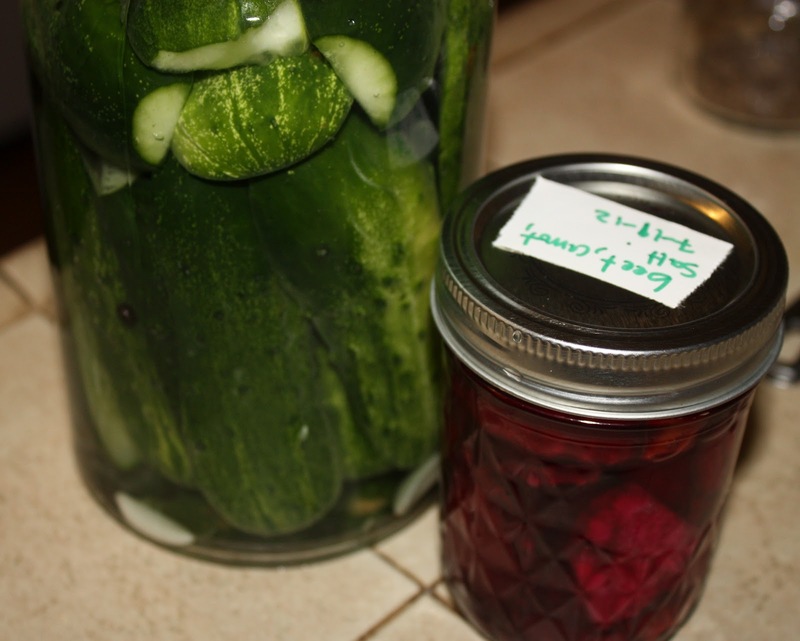 I headed back home to start a new batch of pickles! The chicken stock turned out great. I used a whole chicken from the farmer's market, plus some extra necks, carrots, celery, and onion, and a little vinegar (I was short on cider vinegar, so I used a little umeboshi as well). After simmering for abour 5 hours, I fished the bones and meat out and blended a little of the broth with the boiled carrots and onions for a soup for Laurel. I even stirred in some of my Bulgarian failed yogurt (which tasted great in the soup) and drizzled on some toasted pumpkin seed oil and chives from the garden. 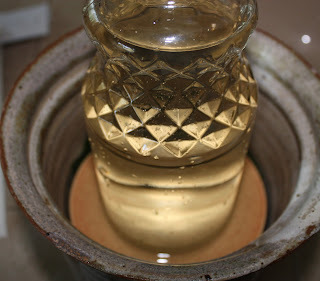 Because I had thrown out all our condiments, I decided to make some mustard. 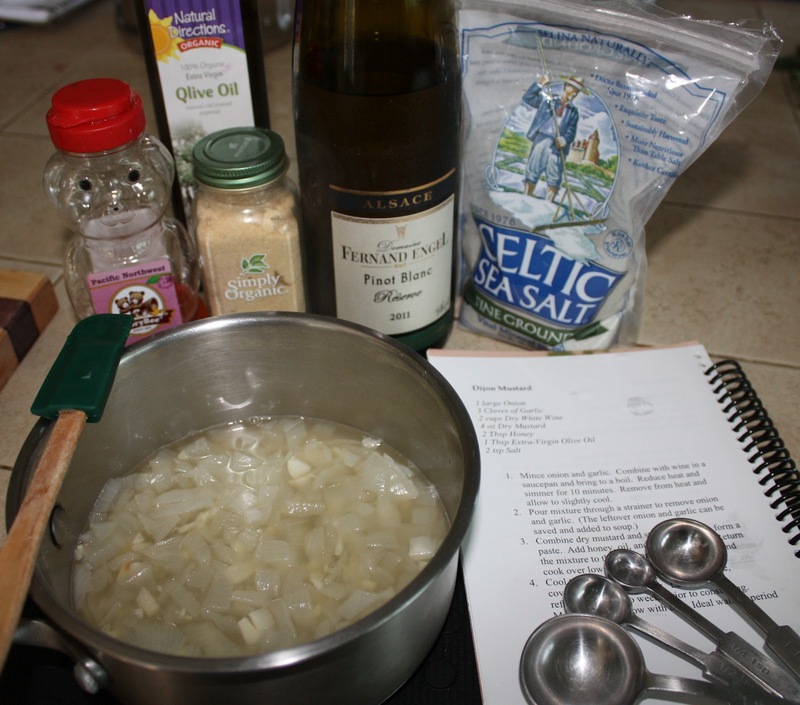 I found a recipe for it in Dr. McBride's accompanying recipe book that called for dry white wine, onions, garlic, honey, mustard powder, and olive oil. I was awed by how simple it was- simply cook it all in a sauce pan until the alcohol evaporates and it thickens. They chill in a the refrigerator for a few weeks until it mellows. I tried a fingerful and was surprised by how horseradishy it tasted. It is almost time to check on my yogurt. Can't wait. GAPS Diet, here we come! 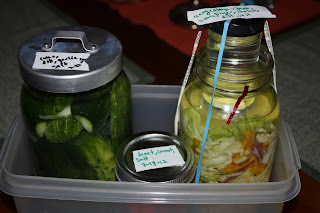 Since everything I have been reading lately has talked about the virtues of fermented foods, I decided to try my hand at it. I started with a one night class, put on by the City of Portland in cooperation with a small teaching farm, Living City Gardens. They demonstrated to an odd assortment of students the methods of punching down cabbage into a sauerkraut crock and how to make a brine for sour beets and pickles. 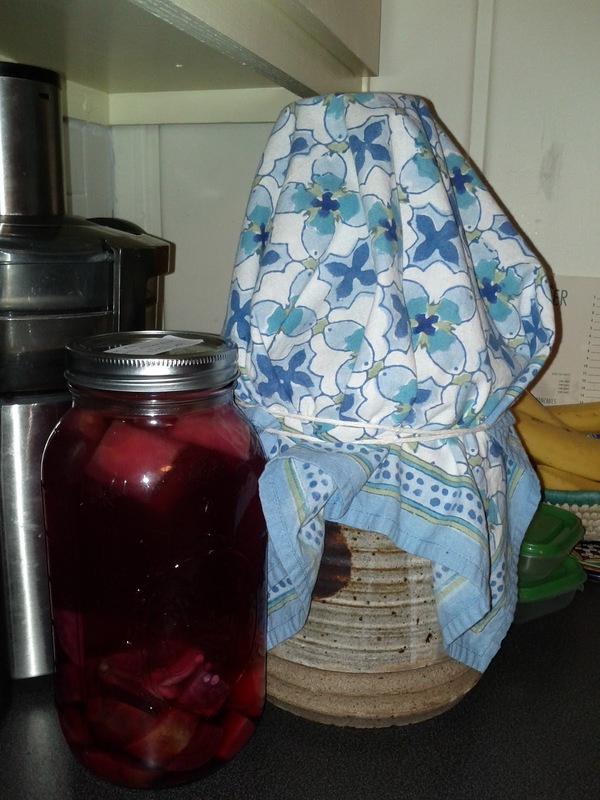 Because I don't have it in me to follow instructions, I came home and made my own attempt at fermented veggies: a brined cucumber pickle and a caraway-beet-ginger-sauerkraut. I had to get creative with the containers because I didn't have anything like a ceramic crock on hand. Here's hoping they turn out! The GAPS book arrived and I started devouring it with what felt like a ravenous hunger. I was fascinated and enthralled by the detailed explanations of our gut flora and the interconnectedness of the different parts of our bodies. Emily (the health coach) had told me not to worry about reading the chapters about schizophrenia and anorexia, and to focus instead on the diet. But I read every page. I read stories about gut imbalances (or dysbiosis) passed down through generations, compounded by poor diet, lack of breastfeeding, use of antibiotics, and other toxic exposure. How some stomach rumblings in a grandmother were passed down to a daughter who had seasonal allergies which was passed down to a granddaughter who became autistic. The basic analysis is that so many of our modern ailments--from depression and schizophrenia to food allergies, autism, and MS are caused by overgrowth of bad bacteria in our intestines, creating toxicity that affects the brain and other parts of our bodies. She explains how a person suffering from anorexia does not just think they are fat compared to supermodels in magazines, but due to toxicity in their guts causing an imbalance in their brains, their actual perception of themselves is skewed. They see themselves wrong. Similar with cases of dementia. Reading about allergies hit home hard. I come from a long line of both food and seasonal allergy sufferers. Additionally, there is cancer, dementia, lack of breastfeeding, toxic exposure (my grandmother was a chemist!) depression, skin rashes, and hives all over my family's medical history. With sudden clarity, I realized that embarking on this GAPS diet was not solely to heal Laurel of her celiac and graves disease. It was for me too. I was just as much a GAPS person as she was. And I was afraid that if I was not able to heal the imbalances in my gut, I could have a child with something worse than hay fever. So I read on. I am still reading in fact. I have to tell myself to put the book down and go put away the dishes or make dinner. And I am still exploring. I stopped by a new health foods store after work and picked up a pamphlet put out by the Westin A Price Foundation called "Principles of Healthy Diets." The pamphlet's advice fit in exactly with everything I have discovered from the SCD and GAPS diets. It talked about the healing properties of bone broths, animal fats, and fermented foods, and decried the modern diet full of starches, chemicals, sugars, and processed vegetable oils. In a way, I feel like my world has been turned upside down. Or that I have walked through the looking glass into a different reality. "Saturated fats are healing, use them liberally," the pamphlet and the GAPS book state, as if today is backwards day. "Do not practice veganism, avoid low fat dairy products and lean meats," they continue, affirming things I intuitively knew (like microwave ovens and factory farming are bad) and also surprising me with how far they are from mainstream "health" wisdom. I am afraid that I have entered a place that will be hard to relate to for people not on this health journey, but there is no turning back. I am ready and open for truth, healing, knowledge and wisdom. 13 days until we begin. We decided to meet with Emily, the Health Coach I had run into at the grocery store, to see what exactly a health coach did. After a few email exchanges to provide some health history and negotiate a time and place, we met back up at the same grocery store where we had our first encounter, this time in the little eating and sitting area in the back corner of the store. I introduced Emily to Laurel and we dove in, the two of them sharing stories of decades of pain and suffering--Emily from Crohn's disease and Laurel from Celiac and Graves. As twisted as it sounds, I think they both loved meeting someone who had suffered as much as they had. Someone who understood. Then we talked about the diet. I told Emily about discovering the SCD (Specific Carbohydrate Diet) through blogs and recipes, and that I had recently ordered and read the book. She asked if I had heard of the GAPS Diet. Like SCD, I had run across references to GAPS on several occasions, usually breezing past, thinking this strange and scientific scientific diet must be for people who are really sick. 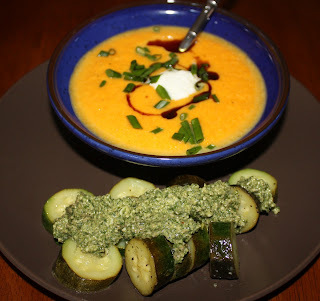 Recently I had run across it again and ended up perusing the website, because from my research on SCD, it seemed the two diets were quite similar, and recipe authors tended to use the terms interchangeably. When I finally visited the website, I was put off when I realized that GAPS stood for Gut and Psychology Syndrome. I was trying to heal Laurel's guts- what did this have to do with psychology? Emily informed me that though GAPS talked a lot about mental disorders such as schizophrenia and depression, the diet was essentially an evolved version of the SCD. A British MD, Dr. Natasha Campbell-McBride, had come along and picked up the diet where Elaine Gottschall had left off, improving it by adding fermented vegetables and krauts, and refining the legal/illegal food list. Additionally, she expanded the introduction phase of the diet to a very structured eating plan involving bone broths and cultured dairy products, meant to seal up leaky guts in preparation for healing. As Laurel had been told by several different health care practitioners that she most likely had a leaky gut (very common in Celiac patients) I was all about this gut sealing business. What terrified me a little bit were the meat broths, sauerkrauts, and severely limited food choices. I told Emily that what we could most use her help with was one little hurdle. Laurel was mostly vegetarian. A reformed vegetarian myself, I had been working on Laurel for the past two years to incorporate more meat into her diet in the name of her health. When I met her she was eating a lot of processed gluten free breads and crackers and dairy- none of which were making her feel very good. We had made baby steps over the years, now I could get her to eat five bites of fried and breaded fish, or a handful of homemade chicken nuggets. The key to my success had always been disguise--if I could grind it up small enough, cover it in a sauce, and fill her plate with enough other things to rotate bites with, I could usually get her to eat it. Now we were faced with the prospect of stripping all the usual cover ups out of our diet and eating plain, simple foods in as close to their natural form as possible. Though Laurel said she was committed, how in the world were we going to do this? We talked some more about how Emily could work with us, and decided to meet back up again in August, when we were ready to dive all the way in to this new way of eating. She gave us each some assignments for the next meeting. Laurel was supposed to work up to eating different kinds of meat at least four times a week and I was supposed to get myself a yogurt maker, figure out how to use it, purge the kitchen cabinets, and read about the GAPS diet. We were on our way. At the grocery store for the first time since discovering SCD (the Specific Carbohydrate Diet) I viewed each item with fresh eyes. What are the hidden ingredients in this? Will this product hurt or heal Laurel's guts? What is left to eat that doesn't contain grains, sugars, chemicals, etc? When reading about the various components and limitations on the diet, one redeeming factor was that it allowed dairy. Dairy had been a mostly forbidden food in our house, with both Laurel and I showing "slightly allergic" to cow's milk in various allergy tests and both struggling with congestion and gastrointestinal issues when we overdid it. We limited our dairy intake to hard cheeses, goat's milk products, and on special occasions sour cream or creme fraiche. Sadly, yogurt and cottage cheese had been totally off limits. I read the chapter on fermented dairy in the Breaking the Vicious Cycle book with wide eyes. It claimed that fermented dairy (i.e. yogurt that had been cultured for 24-48 hours) no longer contained any lactose, was much easier to digest, and was actually good for us. Certain other dairy products such as butter, hard cheeses, and a special kind of cottage cheese (dry curd, pot, or farmers cheese are different names for it) contain very little lactose and are also safe for people with digestive issues to eat. Though I was still a little wary about the congestion side of things, I was too excited about trying this special cottage cheese to worry. I was nervous that I would not be able to find this cottage cheese at my neighborhood health food store because I had never seen it before, so I planned to make a second stop at Whole Foods. Passing the eggs and sour cream case, I noticed a small white container nestled between rows of normal cottage cheese: Alpenrose Dry Curd Cottage Cheese. There was only one option and it was not organic, but it did state that the cows were not treated with growth hormones. I picked up two of them. At the checkout line, a slight woman came up to me and asked what I did with the dry curd cottage cheese in my basket. I told her that I was starting this special diet, the SCD, because my partner has celiac disease. The woman smiled and told me that she also had celiac disease, in addition to crohns, and she had been on the SCD for several years. She said it had saved her life. She told me she was now a health coach who specialized in helping people navigate this very diet. We exchanged numbers and I left the store feeling that our journey with this diet was now bigger than me. The Universe was involved. 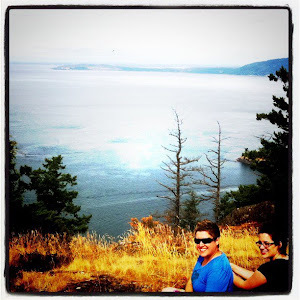 Rebecca lives in Portland, OR with her partner, Laurel, and two cats, Rosi and Judith. When she is not reading cookbooks or planning meals for the week, you can sometimes find her in her herb garden. Her favorite things to make are almond flour muffins, fresh salads, and anything involving fruits, vegetables, meats, or cheeses fresh from the farmer's market.